By George Barber, Country Manager Indonesia, Terra Energy & Resource Technologies (TERT), Inc. The ITB International Geothermal Workshop has been held annually since 2012 by the “Institut of Teknologi Bandung” (Institute of Technology) which forms part of the Geothermal Master’s Program which has been running since 2008 where approximately 200 graduates have studied and have obtained a master’s degree since the inception of the master’s course. This event was held in Bandung, which is about 180 Kilometer from Jakarta via the toll road which on a good day, (early morning) can take 2 to 3 hours, although normally we can rely on anything from 3 to 10 hours, (still a little time before this will be improved) on March 18 – 22, 2019. This event has become a melting pot for the sharing of knowledge of the advantages and limitations of geothermal energy among other renewable energy in the world, especially Indonesia. This is the 8th workshop for geothermal in ITB and is looked forward to each year, where a lot of preparation goes into this, it is hoped that this event will run for many more years to come. Mudrock Media is proud to be a media partner for this important event along with the other media partners “Think Geoenergy” and “Geothermal Resources Council” (GRC). It is not possible to make a detailed report of everything that happened, although it is fair to say that a lot of information was given, and it was very well attended. Following the 2015 Paris agreement, 180 countries, including Indonesia have committed to reducing Greenhouse Gas emissions with the aim of a long-term goal of keeping the increase in global average temperature to below 2°C where one of the solutions is using natural resources such as geothermal energy which can have a significant role to help minimize climate change. Indonesia has 40 per cent of the world’s geothermal reserves (which could be more) and a very large number of human resources. This means that Indonesia has the potential to continue its position as one of the leaders in the industry. Beside geothermal energy, there are other natural resources such as wind, solar, biomass, hydroelectric, and wave power that are or could be part of the renewable energy plan by the government. Each renewable energy has its advantages and limitation, although the lack of understanding of how to harness these has become a challenge for the country, some of these were discussed during this workshop. The ITB International Geothermal Workshop has been held annually since 2012 by the “Institut of Teknologi Bandung” (Institute of Technology) which forms part of the Geothermal Master’s Program which has been running since 2008 where approximately 200 graduates have studied and have obtained a master’s degree since the interception of the master’s course. One of the keywords that is taught for geothermal is “Passion” all students and lecturers must have a passion for geothermal, what is for sure, Ibu Ir. Nenny Miryani Saptadji, PhD and Dr Eng Suryantini (Ninik) ST. Dipl. Geothermal Tech., M.Sc have abundances of passion, where I was told by them that the students always come first with the aim that they will be able to help Indonesia to meet the geothermal potential that it clearly has, the students are the future of Indonesia. An excellent book that has been written by Ibu Nenny, the book is in Bahasa (language) Indonesia, it’s a shame this has not been translated into English, maybe we should encourage her to get this translated. The students are very fortunate, as all of the lecturers are passionate instructors, they always have a smile and extremely helpful. Ibu Ninik, the organiser of the workshop has once again with the help of the students and staff have done an excellent job, it should be appreciated that the students also learn so much by being involved in helping to organise and run the workshop, now they can get back to learning geothermal as they have learnt how to be organisers. ITB Geothermal wants to encourage other countries to take part in the master’s program; at this time, they have two International students on one of the courses that is running. There is no reason in my opinion that ITB Geothermal cannot become the place to go to in South East Asia to learn about geothermal development, not only in volcanic areas but also in non-volcanic areas such as in Malaysia (which includes visual and hidden geothermal potential resources) who are starting to develop some geothermal power from hot water spring type reservoir’s. “Geothermal Energy among Other Renewable Energy: Present and Future”. To improve the community understanding towards geothermal energy as an important part of the renewable energy development plan by the Indonesian government and to discuss the latest conditions that affect geothermal and other renewable energy development in Indonesia. 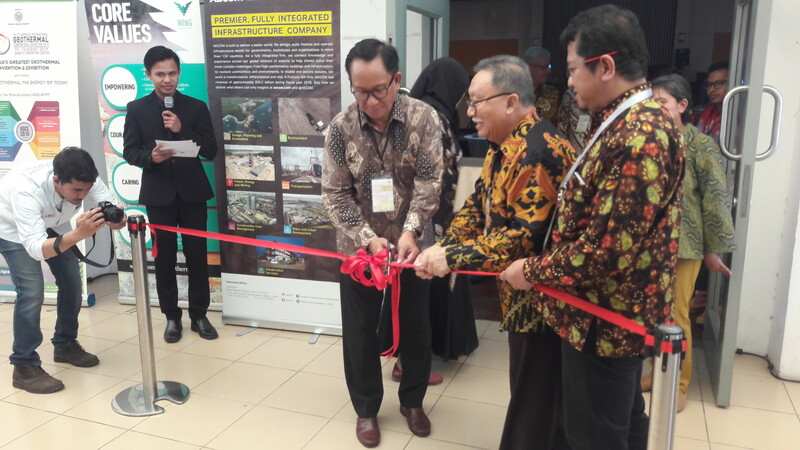 To draw attention from scientists, engineers, including academicians, industrial stakeholders, and also geothermal leaders about the initiatives, strategies, opportunities, and challenges toward geothermal development in Indonesia. To show the commitment by the nation in achieving its 7,200 MWe installed capacity in 2025 (unlikely to be met), which of course needs trained people, which is what ITB, is all about. 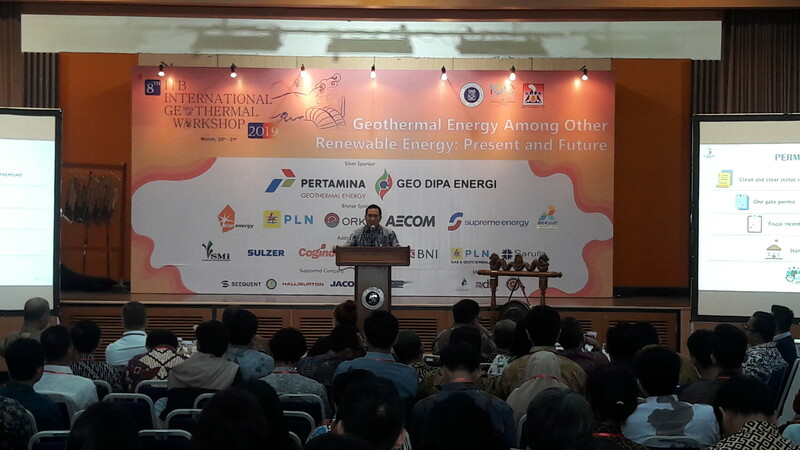 The main plenary and technical session was held on March, 20th – 21st 2019 which was attended by participants from 11 countries, they were several representatives from the Ministry of Energy and Mineral Resources, Indonesian Geothermal Association (lNAGA), International Geothermal Association (IGA), government officials, various geothermal industries and geothermal research enterprises where they gave varied presentations. Update of Geothermal Resources in Indonesia by the main developers within the Industry. Day two is where people have been invited to submit and present their papers. There were 174 abstracts submitted, where 141 was accepted (81%). Out of the 141 abstracts accepted, 107 papers were accepted, 34 of these were withdrawn, 54 was presented and 53 were displayed as posters, this amount is no small number, well done to all that submitted abstracts and to all of those that made it through to the last round as well as the editors of the papers (no small task), well done to all. Another highlight is the gala dinner, which was held at the end of day one, this is a social event for all of the participants to bond and create new connections especially people within the geothermal energy stakeholders. I have to be open here, I do not think that this worked as well as it has in the past, this was mainly due to the seating arrangements and where the food was laid out which was a buffet style affair, this was a shame as the students tried to put on some dancing and ask questions in a quiz format, sadly to say the food took the priority of many participants, which meant that two of the International students appeared to be participating by themselves at one stage, well done to these students! There was a small Exhibition that runs at the same time as the main workshop. Stands and booths are were provided for 3 exhibitors, it would be nice to see more in future events as this is a perfect opportunity for companies to showcase what they do and how they can help Indonesia to achieve its geothermal targets. Other Workshops – Prior to the main workshop, there were three pre-workshops, during the main workshop there were three mid-workshop sessions and then there were post workshop events which included a field camp to explore Tangkuban Parahu’s characteristics as a geothermal field. It is understood that 13 applicants from students, engineers, scientists, and academicians attended this and finally there was a field trip where the participants were introduced to geothermal resources and their utilization at the Pertamina Geothermal Power Station at Kamojang. In Conclusion – A fantastic event, where an interesting time was had by all and a lot of hard work was done to make this event the success that it was, well done to all. Mudrock Media certainly looks forward to being a media partner for 2020; we hope that many new people and past participants will be able to come along to this showcase event in Indonesia. Mudrock Media is a partner with Terra Energy and Resource Technologies (TERT) in Indonesia.